Victorian macabre, don’t mind if I do. If you know me, you know I have a rather… Morbid side and Sillhouette Masterpiece Theatre appeals to that in spades. Oh lords, the puns, I am sorry. 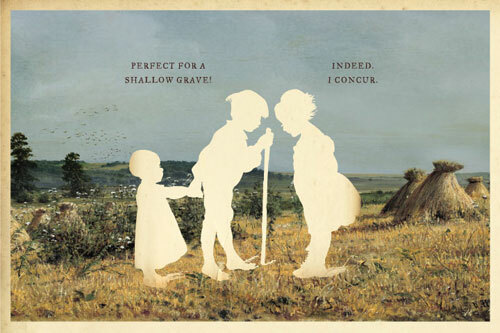 Classic victorian era paintings with victorian sillhouettes coupled with delicious typography and usually black humour. Perfection in an art piece! Though his news feed is on twitter – we’ll forgive him that the world appears to be there, loudly proclaiming themselves to be twits – the work is gorgeously executed and you feel compelled to purchase every single item in the shop – Oh, I’m, sorry, the epically named Bazaarium. Perhaps to put along your hallway or plastered upon the walls of your wood-panelled den in between your mounted deer heads and antlers. Crude? Rude? Innappropriate? MOST DEFINITELY, ENJOY!